Single point diamond dressers are made of selected diamonds mounted in a matrix. Only one cutting edge is presented to the grinding wheel. 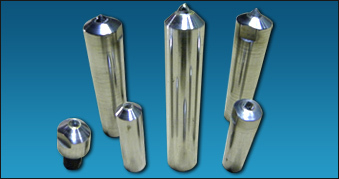 Diamonds for single point dressing tools are selected for their structural strength, number of points, degrees of sharpness, and lack of determental flaws. The proper selection of size and quality appropriate for a given application requires qualified judgment. We offer four grades of diamonds for single point diamond dressers. Considerable care should be taken in mounting the diamond dresser in position diamonds are sensitive to shock and impact. The dresser must be clamped rigidly in place to avoid vibration once dressing begins. An ample supply of coolant should be directed contact at the diamond point before dressing begins, as the sudden application of coolant to the diamond once it has heated up can cause it to shatter.